During our adventures in Bb, we decided to make Boo-boo Bbs. It's easy-peasy, lots of fun, and what kid doesn't LOVE opening and sticking Band-Aids all around? Mama B and Baby b were playing basketball (bouncing a ball, boycotting bananas, whatever). By the end of the game, both ended up with boo-boos! (Let your kiddo add boo-boos if they want. Otherwise you can do it). What should they do? Bandage those boo-boos! Now have them pose for with a super awkward smile! Yay! 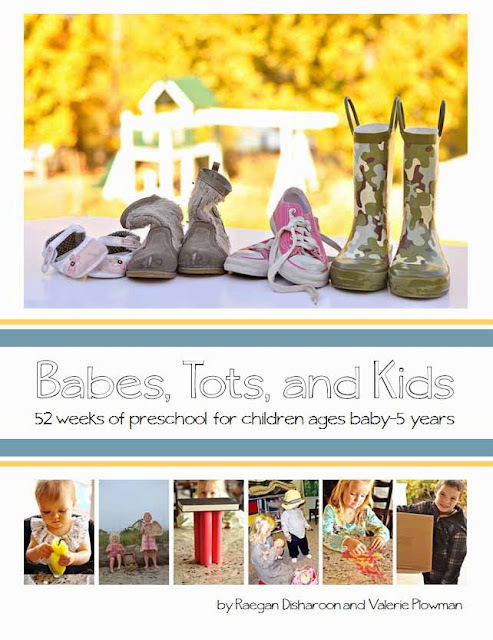 Here are a few practice sheets I made for practicing the letter Bb with your preschoolers! Free to download and share! 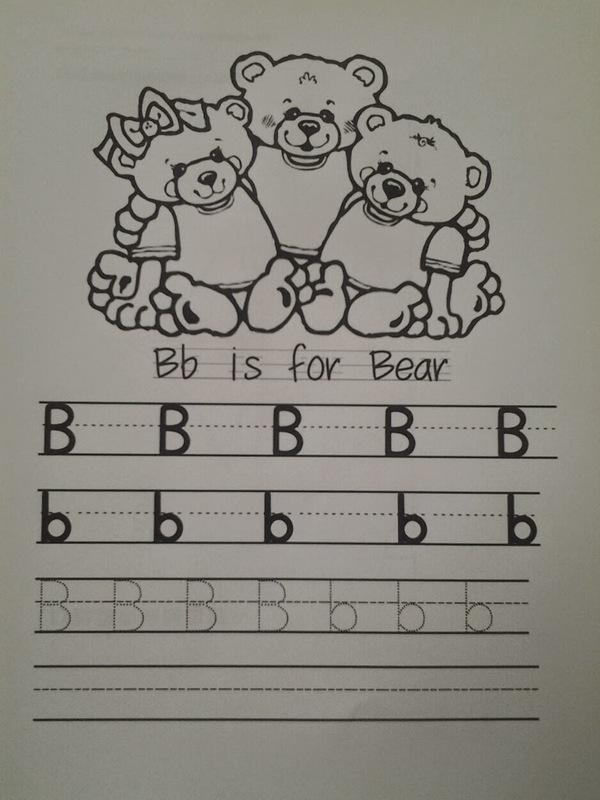 Click on B is for Bears for the B is for Bear handwriting work. With the first two rows of Bb, use a highlighter or crayon to trace them and get the hang of it before tracing over the dotted lines with a pencil. Next, try Balloon Prints! Use an ink pad or washable paint. Read the number in each box and put the correct number of prints in each box. Add a string and you've got adorable balloons and a fun counting activity. 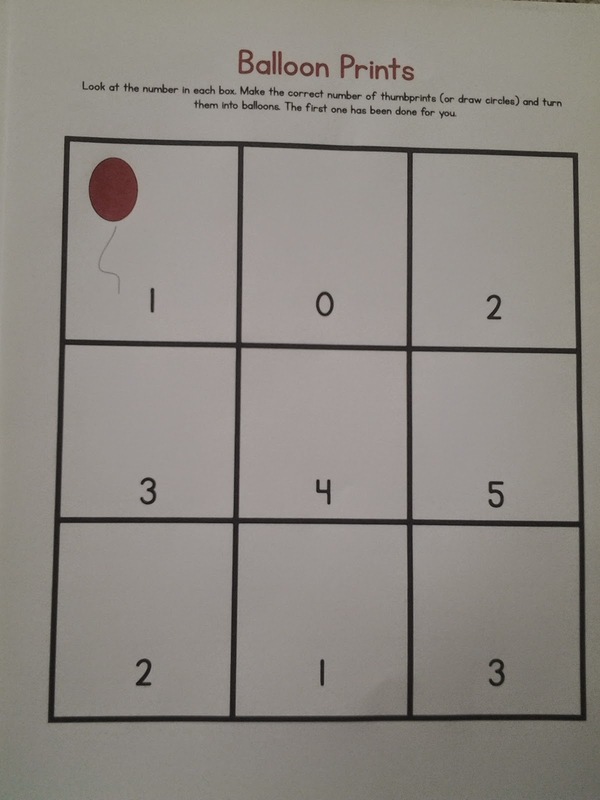 In case you want Balloon Prints without the numbers, so you can customize it, here you go! If you want to reuse the sheet, try a sheet protector or laminating and using rocks, buttons, or just drawing with dry erase markers. This weekend was super busy, so I totally forgot about St. Patrick's Day. Until this morning. So, what can you do if you are unprepared but want to make today fun (and throw some learning in there, too)? Try BrainPop for a fun St. Patrick's Day video. It's a little over small one's heads, but even if they get one or two things from the video, it's worth a shot! Or do a little reading about St. Patrick online. Grab a box of Lucky Charms! The possibilities are endless. I grabbed a few sheets of computer paper and drew up some worksheets really fast. Try tallying, sorting by color, counting, graphing, inequalities ( rainbows > balloons), or an introduction to addition. Separate the shapes into piles. Above Right: Introduction to addition! Make piles (hats + hearts = put them together and have them count). No Lucky Charms? How about gold wrapped candy (leprechaun loot)? Teach positional words (under, next to, beside, over, etc). Hide the candy around the room and give clues using positional words. If this is easy, give multi-step directions. For example: Walk next to the chair, crawl under it, and look under the couch. If all else fails, make sure you're wearing green! :) We are off for a four leaf clover hunt! This is the first in a series of posts that I like to call Stree Free Spaces. This is how we make Mommying and teaching a bit easier during the day. Did I just hear a collective Mommy sized groan? Play dough. Play-Doh. Whatever. No matter what you call it, you and I know the truth. More of it ends up on the table, floor, or ground into the grout or carpet than you ever imagined possible. It's like those tiny dough crumbs multiplied and conveniently nestled their way into the nooks and crannies around and under your table (and somehow on little rear ends), only to be overlooked until it's too late. How about this little friend? There aren't any short visits from this delightful container of shimmery fun. A few shakes and you've got a serious situation on your hands. I know quite a few Mommies that have outlawed one or both completely. Consider them banished. Not me! It's not that I am completely relaxed about messes either. I like it clean and tidy. So, what's a Mommy to do? I think somehow we can marry the idea of sparkly fun and livable spaces. How can we maintain stress-free spaces and use glitter or Play-doh at the same time? I would like to introduce you to my most used, dishwasher-safe, glitter containing, multi-use item. Ready? Lunch trays, I. Love. Them. So. Much. They are 14.5" x 10.75" are craft containing goodness. You can stack 'em. They come in 5 colors for (right now) $10.99. And you can place each separate activity on a different tray for mess-contained-fun-time. Now you don't have to run and hide from the glitter section at the craft store worry! *Tape off a few holes from the glitter shakers! Lessens the flow and prevents alllll that glitter from coming out at one time. *Teach your child how to shake the container. Yes, even the little ones. Shake low and go. Shake up high and Mommy will cry. *You will still manage to find some stowaway glitter on your child's scalp, in their ear, or some other random place. It is the way of glitter. But it will be less with the trays. Way less. So. much. less. *The trays double as a building board for playdough creations. Crumbs are contained (as long as they aren't walking around with it). Washes easily in the sink/dishwasher. Win-win. Frugal tip: If you aren't ready to purchase the trays, try using rimmed baking sheets. You can even pick them up at a dollar store. So, what are you waiting for??? Let the sparkly fun begin!